Billy Beane (Brad Pitt), general manager of the Oakland A's, one day has an epiphany: Baseball's conventional wisdom is all wrong. Faced with a tight budget, Beane must reinvent his team by outsmarting the richer ball clubs. Joining forces with Ivy League graduate Peter Brand (Jonah Hill), Beane prepares to challenge old-school traditions. He recruits bargain-bin players whom the scouts have labeled as flawed, but have game-winning potential. Based on the book by Michael Lewis. 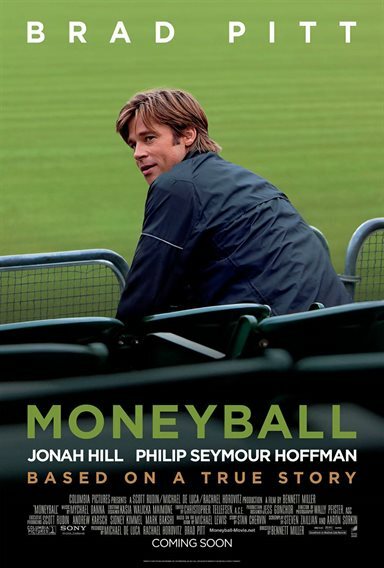 Download Moneyball in Digital HD from the iTunes store. Moneyball images are © Columbia Pictures. All Rights Reserved. Even though the acting is stellar, unless you are a baseball fan or star struck on Brad Pitt, then you may want to shy away from Moneyball. The film gets pretty hot and heavy into the subject matter of money versus mom's apple pie and the rites of summer. It's not about little Jimmy loving his favorite player because that piece of collateral may not be on his favorite team anymore. Much like the movie Wall Street, it's about greed. It's a true story, but as far as I'm concerned, so what. Maybe this will help. Baseball manager Billy Beane (Brad Pitt) has run into a wall with his team the Oakland A's who just lost the chance of being World Champions. The first thing the head office does is trade three of his best players for their money's worth. This puts Beane in the position of getting new players to fill the spots vacated by the meat of his team. Now while this is commonplace as shown by other small markets like Miami and Tampa for example, Beane can't seem to come to grips with another year of rebuilding. With no big money available from the owners, Beane makes a desperate attempt to buy some of the better players in other small markets like in the film's case Cleveland. ‘Are you following me on this?' However, they are in the same situation if they loose their best players and want compensation that Beane cannot offer. During the meeting with Cleveland he meets Peter Brand (Jonah Hill), a bean counter (No pun intended) and number cruncher that has a theory on how to fix a team that's loosing their meat and potatoes. When the two put their heads together, it starts a chain reaction that changes baseball forever. Acting's not everything and the two hour plus film tends to move along at a fast clip leading one to believe that the director Bennett Miller assumes that most of the audience already knows that trading players is part of the money game of baseball. NOT SO, and nor does he project any reason why his audience no matter how well versed they are in the game cares much about how deals are made. Jimmy just wants to see his favorite players and catch a fly ball in the stand. Now, it boggles the mind that no one has ever come up with the idea that Brand and Beane develop to make silk purses out of sow's ears, because isn't that what farm teams are for? And, according to the film it isn't luck that gets hits, it's playing the right person no matter how bad they field or how goofy they pitch or look while batting at the plate. Well that's my rant on the film but if you do want to see some very good acting and don't mind having your brain filled with critical mass, then it's worth a see. I did especially like Brad Pitt's performance as the manager who couldn't be in the stands of his own games. He handles most of the dialogue in the film and does an exceptional job of developing his character to the point of believability. The run-ins with his coach played by Phillip Seymour Hoffman are priceless. But, unlike Michael Douglas's role in Wall Street that affects everyone's pocketbook, although informational and historical Pitt's cold and callous Beane just doesn't make for great entertainment. Moneyball is rated PG-13 by the MPAA for some strong language. But, even though you approve your youngster to attend with you, he probably won't understand the greed of it anyway. FINAL ANALYSIS: Keep your baseball to the ballpark not the movie theater for this one.